Click on the links to see photos of the players. The order of the players is the same as that of the photos. Birth-dates are in parentheses. 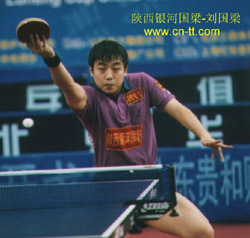 PLA-ICBC : Wang Tao (67/12/13), Wang Hao (83/12/1), Zhan Jian (81/1/1), Bai Shi (85/1/6). Shandong Luneng : Ma Lin (80/2), Liu Guozheng (80/3), Zhang Yong (75/1), Guo Keli (78/4). Heilongjiang Sanjing : Kong Linghui (75/10/18), Wang Fei (74/3/15), Xu Hui (83/11/6), Zhang Peng (79/9/23). Beijing : Tang Peng (82/6), Gao Wei (78/8/5), Hou Yingchao (82/6/15), Liu Heng (82). Guangdong : Qin Zhijian, Ko Lai Chak, Zhang Chao, Chiang Peng Lung (only played the last 3 rounds). Hebei : Li Jing (75/3), Han Yang (78/11/11), Jiang Jianan (83/1/20), Liu Zhijiang (1978), Wang Qin (85/11/13). Tianjin 729 : Hao Shuai (84/10/1), Li Ping (86/5/18), Qiu Yike (85/1/27), Li Yan (85/4/19), Yao Xin (83/7/16). Format: Best of 5 matches, and the first 4 matches of the team tie are always played. First three matches are singles, and the 4th doubles. 11-point scoring is used, and best out of 5 is used for each match. If the score is tied after the first 4 matches, a "Golden-Ball" singles match will be played, and the first player to score 5 points wins the match. In the Golden Ball match, service will alternate after every point. Current service rules were used during Phase 1. Starting with Phase 2, which begins on June 15, the new, no-hidden-serve rule will be in effect. Matches are played on Wednesdays and Saturdays. The first phase of the Super League offers us a glimpse at the depth of the Chinese. Relatively unheralded players such as Hao Shuai, Wang Jianjun, etc., have proven to be the equals of the world champions. The penholder style seems to be alive and doing very well. Ma Lin is my choice for MVP, if such an award were to be given today. Ma Lin has a record of 19 wins and 2 losses, both singles and doubles matches included. He has not lost since the second round. Qin Zhijian, Wang Jianjun, Wang Hao are all penholders that have done extremely well. Liu Guoliang is also performing at a very high level, leading the Shaanxi Guoliang club to some semblance of respectability. To further provide incentive to the young players, the Chinese national team awards 2 points to its young members for every Super League win, and 3 points if the win is over a world champion. The total points, together with results in the internal round-robins, will determine whether a young team member gets to compete internationally. The top 6 young players based on overall scores will play in the Pro-Tours, and the last two will demote to the 2nd national team. This no doubt has given the young players the much-needed desire to beat the established players. Not counting Golden Ball results, here are the top singles players. Ma Lin and Wang Hao are both 10-1. 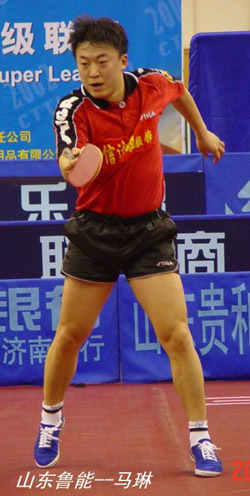 Wang Liqin, Liu Guoliang and Liu Guozheng are 9-2. Kong, Hao Shuai, Wang Jianjun and Zhan Jian are 8-3. On May 22, China and Belgium played a challenge match in China. Earlier this year, the two teams played a challenge match in Belgium, and the Chinese were upset in a 0-3 loss. This time, the Chinese reversed the results, scoring a 3-0 victory. Ma Lin first faced J-M Saive, and went up 2-1. In the 4th, Ma was ahead 10-9, but then Saive played aggressively to score the next 3 points, winning the game 12-10. In the 5th, Ma Lin played the short balls carefullt to control the tempo, and won the game 11-7. China was up 1-0. Wang was normally a much better player than P. Saive, but he quickly lost the first two games at 2 and 6! Then Wang started to find his touch again, and won the next three games at 7, 5, and 6. In the 3rd match, Kong was equally absent-minded, losing the first two games to Bratanov at 6. In the 3rd, Kong had to struggle to win at 9. Bratanov continued to pressure Kong, who had to fight off match points to win the 4th game at 16-14. Finally Kong prevailed 11-9 in the 5th to score a very difficult match. Even though China won 3-0, the players did not seem to be in top shape. This does not bode well for the Chinese in the upcoming Pro-Tours, starting with the China Open at the end of May.